If you’ve been wondering where this gal has been for the last while . . . well the mystery is over! I’ve been glued to my keyboard writing another book that I hope will be a great help and gift to you! The eBook is called Study the Word of God to Change Your Life and it’s available for immediate download. I wrote it because I truly believe God is calling to His chosen people (that’s you and me . . . anyone who is born-again) to step up to a new level in faith! I also know that faith and knowledge in God’s Word go hand in hand. More knowledge . . . more faith. Do you want more faith? Then increase your knowledge in God’s Word! Studying the Word of God to Change Your Life is also a great tool to use during your Daniel Fast! Remember, the Daniel Fast is about a lot more than restricting food. It’s about entering a period of time with intense focus on God and His Ways. Where do you learn about Him and the way He wants us to live a powerful and fruitful life? In His Word. Since teaching about the Daniel Fast, I’ve heard from thousands of men and women who are seeking a deeper and more powerful relationship with God. I know what that hunger is about. I’ve been there, too. But I also know the amazing benefits of getting into God’s Word and having it feed my spirit to such a degree that I literally have to shout! That’s the kind of faith our Father wants us to have. He also wants us to know Him and who we are as His children. So He gave us His Word. He wants us to live a powerful and amazing life so that people will see us and want what we have. That’s being a powerful example of Christ in our lives . . . I hope you will look into this new eBook. It’s getting great reports from all who have seen it. I am delighted that God led me to create this book. Writing it was a powerful experience as I too focused more on the amazing power we have accessible to us . . . and it’s all in His Word! A treasure chest of love, grace, mercy, hope, faith and power! Men and women with insulin or Type 2 diabetes experience wonderful results on the Daniel Fast if they are wise about the foods they eat. Whole grain cereals and leafy green vegetables are packed with protein yet very low on the glycemic index. The same is true of legumes. Many people with Type 2 diabetes are able to balance their blood sugar levels with the food they eat and can soon eliminate or drastically reduce the meds they take. The same is true with insulin-dependent diabetics – often able to greatly reduce the amount of insulin necessary to balance their BS levels. You will want to make sure to eat foods that are low on the glycemic index and not sugary fruits. Of course you want to take the advice of your health professional and access your own knowledge. 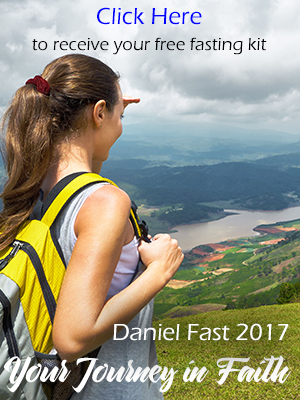 If you don’t already have one you can order a copy of the Daniel Fast Guidelines by going to http://www.daniel-fast.com and enter your email address, they will be emailed back to you, this is a great resource to have on hand while on your fast. Be Blessed on your Journey! Be blessed on your fast, dear one. Look to Jesus – the author and finisher of our faith. When cravings come up, look to Jesus. When you are tempted, look to Jesus. When you feel week, look to Jesus. He is our strength and our help in time of all troubles! I hope the very best for you on your fast! Hi Susan today is the 1st day on the Daniel Fast.I have fasted before but feel more ready for this one.I want to have a more intimate relationship with god and i want to spend more time reading the word and having more understanding and want to speak in tongues.Please pray for me so that i can have enough strength to get through this and have my prayers answered. I’m trying “hard” to start the Daniel Fast along with my church, but boy am I having a hard time, mentally. I am definately going to give it my best shot. I cannot let food have this much power over me. Fasting for a deeper clearer, relationship with God, healing and deliverence for my immediate, extended family & church family. Please, please pray for me. I’ll Surely love to lay my hand on “Study the Word of God to Change Your Life” too. I also agree with you when you said “do you want more faith? Then increase your knowledge in God’s Word” – Thanks Susan. Pulse is food grown from seed and therefore the Daniel Fast centers on fruits, vegetables and whole grains. There is a lot of erroneous teaching out there on the Daniel Fast. That’s why I have spent the last three years researching the fast and only write from that base of knowledge. Praise God that He is calling you to a closer walk with Him! You might want to check out Study the Bible to Change Your Life! Hi, I have just began, I am praying that the fast and the in-dept study, getting away from the TV will lead me iinto a closer walk with my Lord. I’ll pray for you. God will tell you the next step, which always forks our road and causes us to choose His way or our old way. I’m fasting for my 2 older kids (23 & 20), who are traveling through Europe. The oldest is in Germany for 2 weeks on a missions trip, then his sister will join him as they travel for a month. I’m praying that everywhere they go they will be able to minister to people they meet. Also, for my third (19) who will spend next year in Africa. This leaves my fourth (17) to spend some quality time with me before she embarks on her last two years of high school. Go to http://Daniel-Fast.com to find the eBook there. Supernatural can be a catch phrase, but if you are talking about the power of God to act in ways that are not common to man . . . then I think they are as real as physical things. I’m not sure what you mean about other cultures. Other from what or whom? God is the Creator of the Universe and all people. Christ died so all could be in full communion with God through faith in Him . . . that in itself is very supernatural! Where can I purchase this?? I looked on Amazon and Amazon’s Kindle store. Is it out yet?? ?